Create visual fluidity by coordinating these vibrant paper tag assortments with the aesthetic of your shop! Bright Zebra print is a fun way to express the energetic, funky style of your location. Each pack of 500 comes with a balanced mixture of 5 patterns or color variations (100 each). These price tags are pre-strung and blank on back for easy personalization or pricing. With a scalloped edge they measure 1 1/16" wide by 1 5/8" high. 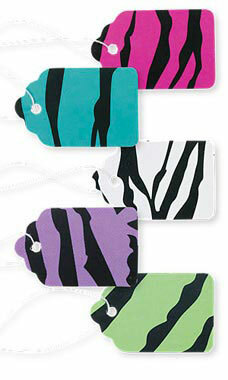 Great for boutique shops and thrift stores, these zebra print paper tag assortments will add style and flair to any display.